Dr. David A. Wallace, from Mississippi State University, presented his whitepaper, “Voltage Dependence of Dissipation Factor Measurements on High Voltage Instrument Transformers” at the 2018 IEEE International Conference on High Voltage Engineering and Application (ICHVE) in Athens, Greece, September 10-13, 2018. The paper discusses performing Dissipation Factor measurements at lower, safer voltages. 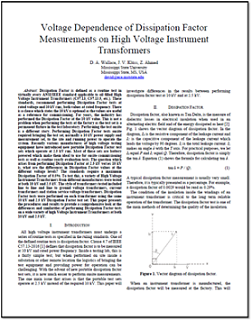 Request your copy of the whitepaper, “Voltage Dependence of Dissipation Factor Measurements on High Voltage Instrument Transformers,” written by Dr. D. A. Wallace, J. V. Klüss, and Z. Ahmed, from Mississippi State University.